E-mail notification with %RecData% variable included in message body now displays changed columns in red when record is modified. Ability to trigger the notification on "File Attachment" columns change. 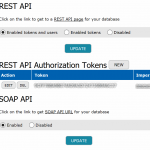 Added TeamDesk SOAP API to allow you to easily integrate TeamDesk with your applications, and to build new applications that work with TeamDesk.